There are several interesting pathways in the film, all leading to a pit of hell that keeps descending to madness. The extreme nature of the story is in the build-up of commerce, and what everyone has to sell to everyone else to survive. And how does a black man “sell” something to the white devil? By putting on his voice and airs, to reassure their whiteness that everything is a-okay. The white voice is simply hilarious, and emphasizes a still powerful-yet-dying breed of humanity in America. The company called WorryFree is so likely that I expect it to start up soon. It offers basic subsistence… food and shelter… for a life of assembly-line work on various technologies (similar to a labor force in China). This new slavery is so slickly marketed, that Cash becomes entangled in its reach. 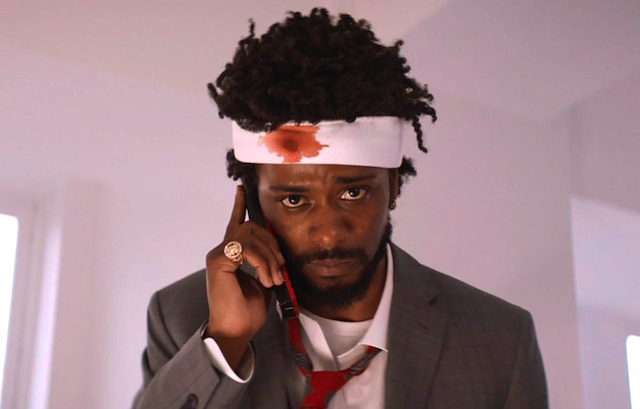 Lakeith Stanfield has a star-making performance in “Sorry…” and handles all the stages of his character’s sellout and rise with equal aplomb, and is especially hilarious mouthing that white voice. The bizarre rapidity never lets up in the story, which concludes in a debatable point that is elusive and somewhat overwrought in its symbolism, but certainly not beyond the realm of the human condition (if it were available). It’s all part of Boots Riley’s manifesto within the film, how we’re all cogs in this hyped-up machine, and we’re all replaceable until we are not, which for most people is death. Again, when reality is screwing us into the ground, cinema art comes to save our souls, or at least put us in a place where we can cope. 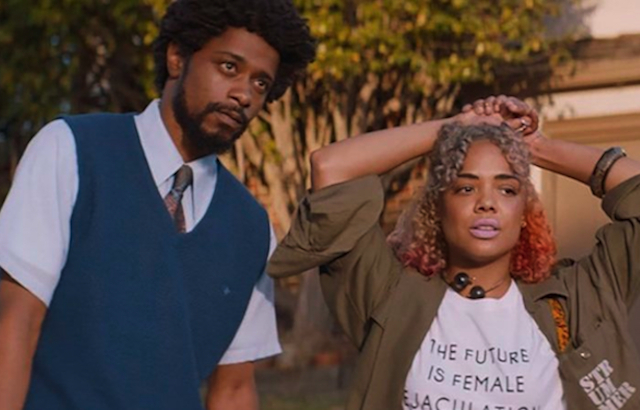 If you are feeling a lesser sense of your own place in this life, “Sorry to Bother You” is there to remind us that this life can always be surreal and more desperate, so all we can possibly do is laugh.